Become Wealthy by Developing the Mindset — and Skill Set — You Need to Achieve Financial Independence! In today’s society, instant gratification and “keeping up with the Joneses” are common place. If you’re like so many people in America — and in the world — you constantly compare the things you have to the things your friends and neighbors have. You want what you want, when you want it. And you get it. The result: you’re in debt. Lots of it. Your monthly bills have piled up, and you’re lucky if you can put a few bucks in savings every now and then. You feel like you’re drowning in debt. What’s worse is that you have no emergency fund, no retirement fund, and the only thing you can hope for is that you haven’t maxed out your credit cards if something comes up. Fortunately, life doesn’t have to go on like this. You can create and implement a system — based on proven methods — for getting out of debt and starting to actually save. You CAN become financially independent — even if you have tons of debt now, even if you don’t make a ton of money, and even if things seem really hopeless. Introducing “Wealth Building Made Simple,” my compilation of the BEST, proven, tested methods TO creating financial freedom so you can become wealthy. Finally, all in one place, you get absolutely everything you need to get out from under the debt and begin to build the wealth you want and deserve. Based on strategies that have worked for thousands of people — to help them go from broke to FREE in a matter of just a few years — this program contains road-tested recipes and formulas you too can use to break free of the debt — and the stress. 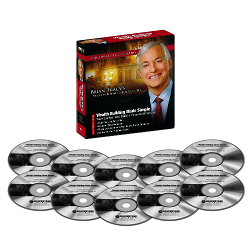 This little gem does for money what other Brian Tracy programs do for your mind. You’ll get practical steps to improve your financial situation and accumulate more wealth. My book covers everything you need to gain financial independence. And of course, you’re covered by my 1-year, 100% satisfaction guarantee. 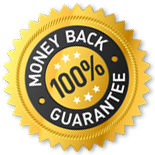 If, within a year of ordering “Wealth Building Made Simple,” the content doesn’t meet your expectations, return it for a full refund — no questions asked. Order your copy of “Wealth Building Made Simple” now, so you too can become wealthy! This is a winner if financial independence is on your to-do list! You can continue on your current trajectory, racking up debt and just scraping by, until you retire, at which time you can hope Social Security still exists and that it’s enough to pay your grocery bills. If not, you can always get another job and continue working long into your eighties. Or, you can take action NOW. You can invest in yourself and learn how to build a financial fortress. I chose the second option, and I’ve earned $1 million in 9 different businesses. And remember, I was a high school dropout who started with nothing. Order your copy of ’Wealth Building Made Simple’ and finally become wealthy! For the school of hard knocks, there is two things you are going to pay before you become successful that I know of: money and time. I bought two coaching programs, the first one didn't turn out because it wasn't what I expected and after that I bought another one, which didn't work for me. I accumulated approximately $5,658.38+ in debt. I took me a little less than three years to pay it off because I was trying to start a business and that didn't work out. I got a job that was helping to pay off the debt and after a year and three months, I got a better job last February of 2014. I was able to set a goal and made a plan by writing them down to finally eliminate my debt by figuring out how much I could pay it off by the end of April of 2014. I did not make it by that date, but was only shy by two days. On May 2nd of 2014 with the help of my federal and state IRS checks I was free and clear of bad debt and paid the remaining $587.92. I wanted to meet my goal hell or high water and was determined to do it if I made a plan. It is very, very important to set a deadline and if you don't make it, set another one. I am not successful yet, but write down my goals now to plan for the next year and work on them. I wish all of you good luck and learn from the best of the best because they produce the greatest results for you. I suggest reading books before getting coaching since it is cheaper and have a greater return of investment. Try to apply what you learn in the books and start from there. May you have great health, happiness and success. Take care, and thrive and prosper! Great comprehensive material with timeless content that touches all aspects of financial advise.